Remove four capscrews (Figure 2, Item 1) securing cover (Figure 2, Item 4) on box (Figure 2, Item 2). Remove cover (Figure 2, Item 4) from box (Figure 2, Item 2). Tag and disconnect wiring from pushbutton (Figure 2, Item 5). Remove large hex nut (Figure 2, Item 3) securing pushbutton (Figure 2, Item 5) to cover (Figure 2, Item 4). Remove pushbutton (Figure 2, Item 5) from cover (Figure 2, Item 4). Discard pushbutton. 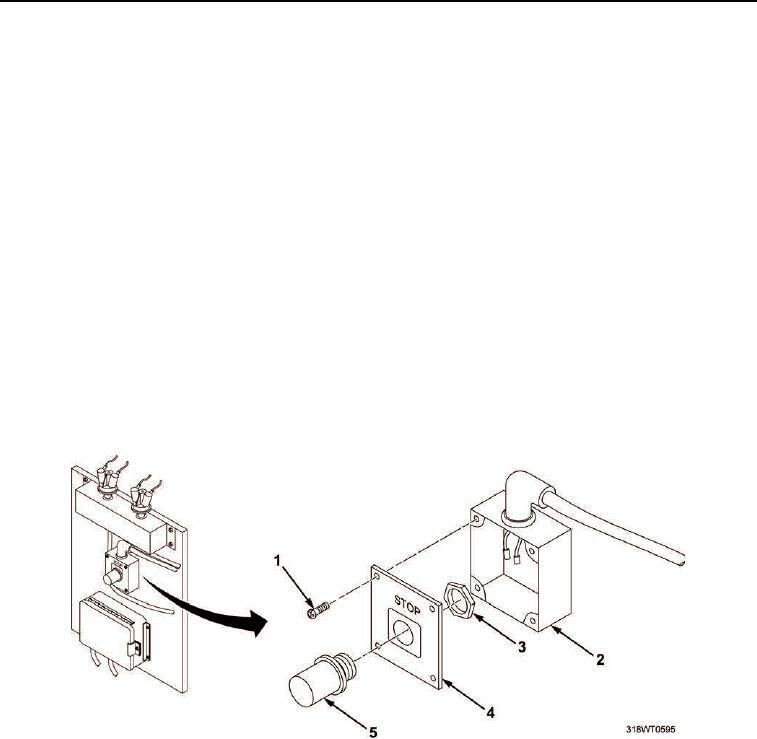 Install new pushbutton (Figure 2, Item 5) on cover (Figure 2, Item 4). Install large hex nut (Figure 2, Item 3) to secure pushbutton (Figure 2, Item 5) to cover (Figure 2, Item 4). Tighten large hex nut (Figure 2, Item 3). Connect wiring to pushbutton (Figure 2, Item 5) and remove tags. Position cover (Figure 2, Item 4) on box (Figure 2, Item 2). capscrews (Figure 2, Item 1). Figure 2. Stop Button Box.